What Is an Email Organizer and Why Should I Use It? Does your email client make you feel stressed and anxious? Then it might be the right time to learn how to use an email organizer such as Clean Email to clean up your email and make it useful again. What Is an Email Organizer? An email organizer is an app whose purpose is to help you organize your email. The best email organizers support all major email providers, including Gmail, Yahoo, Outlook, AOL, Fastmail, and iCloud. Some email organizers are available as desktop applications, but most modern ones embrace the SaaS (Software as a Service) model, in which software is licensed on a subscription basis and is centrally hosted. Most email organizers can be tested for free, with paid premium subscription plans available for those who would like to keep using them. Considering that the average office worker receives more than 100 emails a day, it’s easy to see where the value of organizers comes from and why it makes sense for businesses and individual users alike to pay for one. Why Should I Use an Email Organizer? A good email organizer app such as Clean Email allows you to efficiently eliminate email clutter with just a few simple clicks. Instead of going through your emails one by one and manually separating emails you want to keep from those that can be deleted, an email organizer app can analyze the headers of your emails and use the information in them to organize your emails into easy-to-review bundles. Many people waste hours trying to figure out how to organize email inbox and ensure that it won’t become cluttered ever again only to find it unusable after just a few weeks. Clean Email and other advanced email organizers provide you with an assortment of useful tools that can help you maintain a clean inbox going forward. Instead of pondering how to organize work email when you barely have enough time to meet deadlines, you can apply automatic actions to incoming emails, so they always end up in the right folder and are labelled accordingly as soon as they arrive. Let’s say that each email you receive takes you just 5 seconds to organize manually. If you, like most office workers, receive around 100 emails a day, you spend 500 seconds, or a little over 8 minutes, every day on email management alone. That may not seem like much at first but consider that 8 minutes of email management a day adds up to more than 2 days over the course of a year. That’s a lot of wasted time that can be saved with virtually no effort at all just by using an email organizer app. If you’ve read everything so far, our first choice of an email organizer app shouldn’t surprise you because we’ve already mentioned it several times. Clean Email is an excellent email cleaner app designed for people who want to achieve Inbox Zero with minimal effort. Clean Email relies on sophisticated algorithms to analyze email headers that contain subject line, sender and recipient information, dates, email size, and similar metadata. Because Clean Email never touches the actual content of your emails, you can trust it even with your most personal information, which is something that cannot be said about every email organizer app out there. It takes just a few minutes to learn how to organize your email with Clean Email. To get started, all you have to do is sign in with your email service provider and authorize Clean Email to access it. 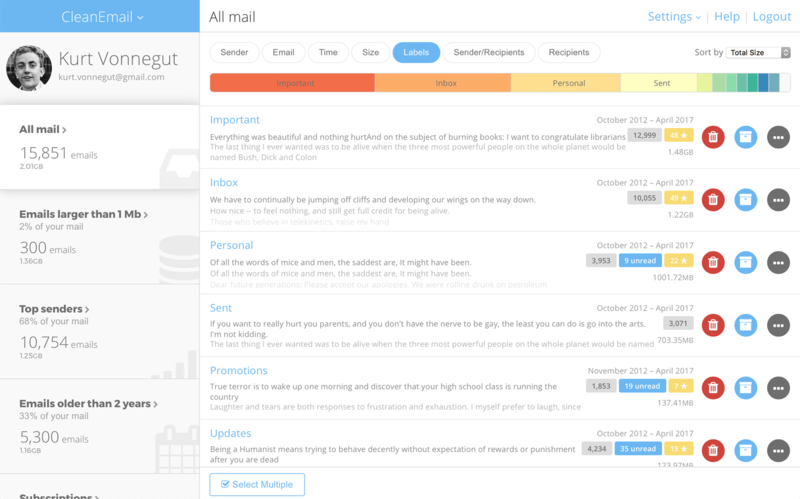 Clean Email will automatically analyze your emails and categorize them into easy-to-review bundles. You can then remove, archive, move, label, and do other things with entire groups of emails instead of selecting individual emails one by one. Each time you apply an action to your emails, Clean Email gives you the option to automatically apply the same action to all matching emails in the future. For example, you can automatically mark all emails from social networks as read or you can automatically archive all forwards from your coworkers. All the automation rules you’ve created can be managed from a single dashboard, so there’s no need to worry about missing emails because of an old automation rule you forgot about. Have you ever noticed that important emails have the tendency to arrive at the worst possible moment? With Boomerang, you can take messages out of your inbox until you actually need them with a simple click of the Boomerang button. This simple yet extremely useful tool for Gmail will archive any email you select and bring it back to your inbox, marked unread or starred when you need it again. You can also use Boomerang to automatically send emails at the perfect time—all you have to do is write them beforehand and tell Boomerang when to send them. Boomerang is available on the Chrome Web Store, and its basic version is free. Much like Clean Email, Unroll.Me is an email organizer app that can unsubscribe you from unwanted subscriptions with a single click. Unroll.Me can also combine your favorite subscriptions into one beautiful digest called the Rollup, so you can keep up with all the latest deals and social media notifications without spending too much time on them. Unroll.Me is available as an Android and iOS app, and it currently supports Gmail, Google Apps, Yahoo! Mail, AOL, and Outlook.com accounts. We hope that you now understand what makes email organizers so useful. Email isn’t going anywhere anytime soon, so it’s better to learn how to keep it organized now than wait for things to get even worse. 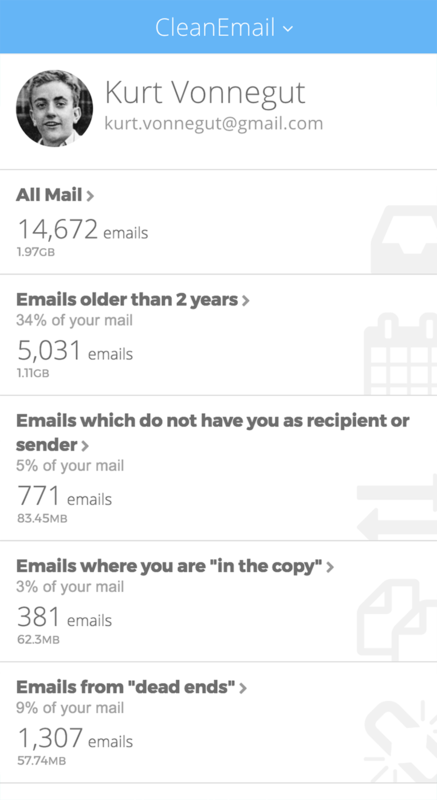 Even though the number of spam emails users receive on average every day is constantly rising, a great email organizer app such as Clean Email can help you maintain a clean inbox regardless of how many emails you receive every day.